ATC unveils premium stereo amplifier and CD player pair | What Hi-Fi? ATC might be better known for its stereo speakers, but the company has been known to dip its toe into the world of hi-fi electronics now and then. 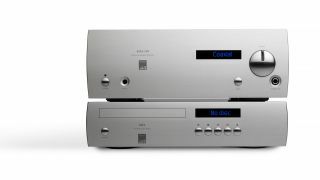 Its latest offerings take the shape of CD2 CD player and SIA2-100 stereo amplifier. They're both heavy duty and heavily damped machines - each one features a 12mm aluminium front panel which is finished in brushed and anodised 'titanium' silver. Such as the one found in the matching SIA2-100 stereo amp. Like the CD player, the amp is a two-thirds width design yet still manages to squeeze in a wide selection of connections, including two pairs of analogue inputs, a 3.5mm input and trio of digital inputs - optical, coaxial and USB Type B. The USB input can handle a wide range of sample rates up to and including 32-bit/384kHz and DSD128. Total power is 200W (into 8 ohms) and the amp uses separate power supplies for the SIA2-100's pre-amplifier and power amplifier sections to reduce cross-talk and distortion. There's also a Class A headphone amplifier built-in, which comes complete with a 6.35mm headphone jack. A button on the front of the ATC allows you to cycle through inputs while the amp's volume control uses a high-quality Alps potentiometer. The ATC separates don't officially go on sale until April, but you'll be able to hear them at the Bristol Hi-Fi Show, which starts next Friday, the 22nd February.